Invoice is the prime document for any business is concerned. 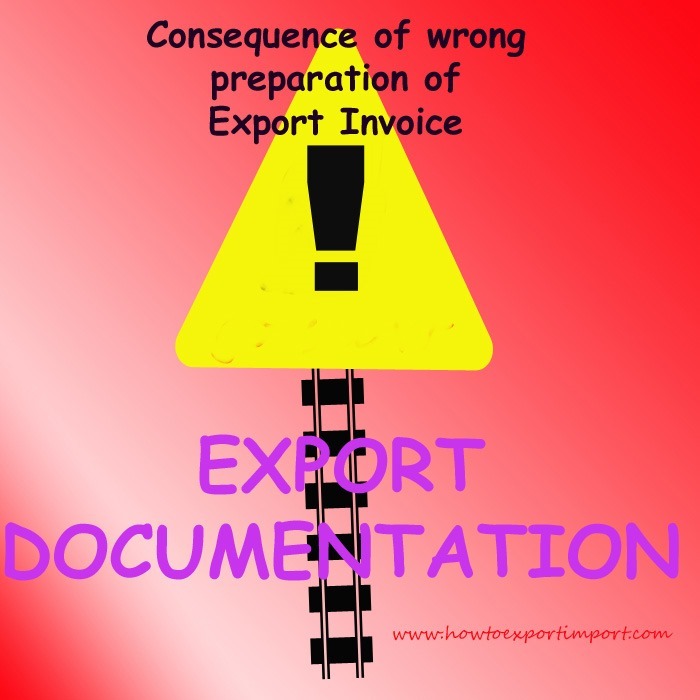 Export invoice plays a pivotal role in international trade. As per my experience in the international trade for more than 20 years, I realize and advise all my colleagues about the importance of care to be taken while preparing commercial invoice. Certainly you will come to know the reasons at the end of this article. You (seller /exporter) prepare export invoice on the basis of purchase order or Letter of Credit issued by your overseas buyer. Your best attention is required on preparing invoice as this is the first and most important document, especially in case of shipment under LC as the opening bank pays amount of proceeds to you, if all documentation are in order as per Letter of credit requirements. Although the columns like Exporter, consignee, invoice number, order number, notify part if any, port of loading, place of receipt etc. are important, port of discharge, place of delivery, amount of invoice etc. are crucial. Let me explain with an example. You have two documents to be prepared on the same day meant for different buyers and different destinations say to New York and St.Peters berg. By oversight, you have interchanged the port of discharge each other. What happens if port of discharge mentioned wrongly in invoice. 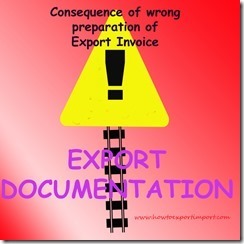 As you know, once after preparing invoice you arrange to deliver the same to your customs broker for filing. After receiving documents , the customs house agent files shipping bill on the basis of invoice you had delivered. Please remember, once after completion of customs formalities, the shipping company as a carrier issues Bill of Lading on the basis of shipping bill. The goods are loaded in to ship on the basis of information on shipping bill and carrier’s instruction. So your goods meant for St.Petersberg are moved to New York and vice versa. Kalpita: On 12 February 2015 Could you please guide me in the documentation, certification and procedure for exporting cowdung to US, IL to be used for performing yagna. Sid Kothari : On 18 February 2015 We want ship 4kg box with dimesion of 700mm*700mm by air to dubai from Indore.Pls suggest most economic way of shipping and also when we quote to the buyer do we have to include import duty in our final quotation or buyer will have to handle it. Admin: On 18 February 2015 Hello Sid Kothari, Please collect more information in this website about import export business. Abhijit Bonde: On 11 May 2015 can u give me standard format of invoice and packing list? Sayed: On 31 August 2015 Sir, I recently started my own business of furniture export to overseas market.Even I got few orders also from US, now my company is playing a part of sourcing agent I get order for furniture get it manufactured in India and sell it to buyers. Now problem is I dont have an IEC so can I use my furniture manufacturer's IEC to ship products. Raj Chandra: On 05 April 2016 Hi, I want to know the complete process of exporting seeds to USA in large amounts say 100Kg per month, say from Mumbai to Maryland. Kindly let me know ASAP Thanks in advance, What documents and licences I need what should apply for, How much does it cost, What customs clerance and hurdles there are. Vipulbhai Mistry: On 25 December 2016 Hi, i want to export my products hinges in stainless steel, brass metal belong in building hardwear. what to do to start export in overseas market. How i find buyers in globle market in my products. pls light me to start new adventers. kamal khandelwal: On 29 March 2017 how to get the BRC generated for claim MEIS benefits? KRISHNA GOKHALE: On 03 September 2017 I want to export Herbal pesticides for crop crop protection to African countries. Please advise the correct procedure starting from free sampling. My buyer wants wants 40 kg samples for registering with local govt.